Saturday morning at Morrisons in Saltney. Cheapest diesel in Cheshire! This is because it’s actually in Wales. Yes, there is another country at the end of the road. Mummy has decided to give Daddy a lie in (the following is therefore ENTIRELY HIS FAULT) and kill the two birds of stocking the fridge and keeping the twins safely contained for an hour with the hitherto reliable stone that is plonking them into a supermarket trolley. Mummy – a willowy Cameron Diaz lookalike, with added serenity. Flopsy and Mopsy – two and a half year old twins, who both have little curls, right in the middle of their foreheads. Mummy is airpumping at having snaffled the only double seated trolley in the ‘hood. Mummy: Right, let’s go shopping ladies! Mummy: What’s wrong? Oh, do you want to do the strap up? You’re a bit big for that now, but let’s see. Mummy does the strap up and Flopsy stops crying. Mopsy starts crying. Mummy: Oh, do you want your strap done too? Ah, well, look, it doesn’t have the catchy bit on the end. It won’t work. Mopsy’s crying grows louder. Mummy attempts to shove the fraying, catchless material into its counterpart. It falls out and Mopsy now screams. Mummy takes the Nicorette gum from her mouth that was intended to provide relaxation during the shop and uses it to stick Mopsy’s straps together. The merry band head into the shop. So much optimism. Mummy takes out the shopping list. Flopsy snatches the shopping list and begins to eat it. Mopsy cries because she doesn’t have a shopping list. Mummy rips the list in two and gives them half each. She will now endeavour to do a week’s family shop from memory. This will have hilarious consequences involving finding alternatives for loo roll and Big Brother Joe not having his daily ketchup intravenous drip. Mummy: Well done darling, yes, apples. Mummy: Well, no, not for you, because we’ve got apples in the garden so we don’t need to buy any. Mopsy’s bottom lip quivers and Mummy tries the classic cucumber distraction technique. Mummy: Oo, look, shall we get this nice cucumber? Can you hold it for Mummy? Mopsy pushes the cucumber down her T shirt. This doesn’t prevent Flopsy from trying to grab it. A tussle ensues. Mummy: No fighting ladies! We can BOTH hold something, see. Mummy gives Flopsy a bag of carrots (appropriately, for someone called Flopsy). Flopsy: No, mice wan cuecue. Mummy: Mopsy, can we swap the carrots for the cucumber? Mopsy smiles beatifically, and the exchange is made. Mummy breathes, and heads off towards the potatoes. This is a mistake. She turns back to see Flopsy leaning her head on Mopsy’s shoulder in love, but Mopsy is pushing her off. Mummy jogs back to the trolley. She levers Flopsy (and her oddly heavy head) off Mopsy. Mummy: I don’t think Mopsy wants a cuddle at the moment, though it’s very kind of you Flopsy. Just let her hold the carrots in peace, ok? Mummy returns to the potatoes. This is her second mistake. Mummy spins round just in time to see Flopsy leaning into Mopsy again and – the horror – invading her legspace too. Mopsy shoves Flopsy’s head. Flopsy retaliates, still smiling, by yanking Mopsy’s hair. Mummy flies to the trolley, removes Flopsy’s hand, and scoops Mopsy out of the trolley for a cuddle. Mummy: Flopsy, that’s naughty! Say sorry to Mopsy. Mummy: Oh poor Mopsy, let’s kiss it better. Ah, all ok now? Mummy attempts to put Mopsy back into the trolley. This is her third mistake. Mopsy assumes rigor mortis, with her arms upstretched, so that Mummy cannot hold her, and thus manages to descend to the floor. Mopsy: Hant? Mummy hav hant? Mummy: OK, maybe that’s a good idea. I’ll hold your hand and you can walk along while Flopsy stays in the trolley. 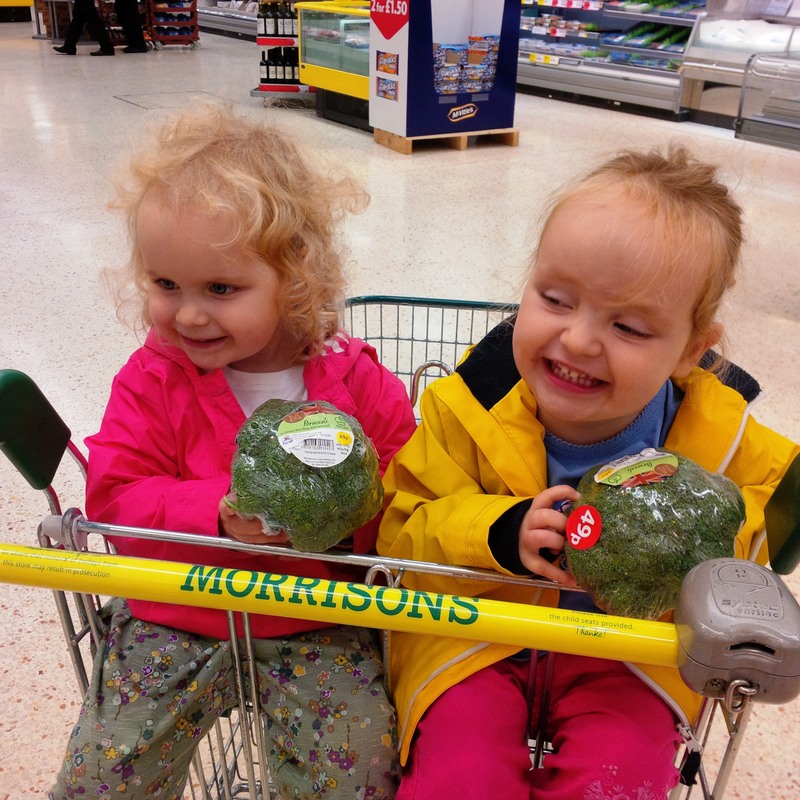 They manage to achieve the fruit, veg and ready meal aisles (rather tricky when Mummy is holding Mopsy with one hand and pushing the trolley with the other), before Flopsy decides on the floor is where it’s at. Down with the other kid. Mummy: OK, Mopsy, shall we swap round? You go in the trolley and Mummy can hold Flopsy’s hand? Mummy: Right, well, if you’re both down, you’re going to need to hold onto the trolley so you can stay with Mummy and not get lost. Mummy lifts Flopsy out. Mopsy has run towards the scores of delicate glass bottles in the drinks aisle; Flopsy promptly high tails it towards Baked Goods. Mummy executes an impressive slalom action through the other shoppers and retrieves both escapees. Mummy: I really need you to hold onto the trolley so you don’t bump into anything. Can you do that please? They duly hold onto the side of the trolley. The same side. The party manages to negotiate Sauces and World Foods in this fashion but, inevitably, the fact that the twins are on the same side means they tread on each others’ toes which is DREADFUL. Mummy therefore places them on different sides of the trolley. This decreases the fighting, but means they are now taking up the entire aisle width. Shoppers are divided between the ‘awwww!’s and the ‘hmpf’s. Mummy thinks bad thoughts about the ‘hmpf’s. She would like to think the wholesome goods in the trolley and the middle class tones in which she is shouting ‘Flopsy! Mopsy!’ would counteract The Looks, but she has forgotten she is in Wales. Sadly they are proven right as the trolley’s turning circle with its toddling side extensions is now roughly that of a sixty foot canal boat, and they manage to take out the top layers of a Malt Loaf display. Mummy scoops up Flopsy so she is now carrying her on her hip with one hand, and using the other hand simultaneously to push the trolley, gently steer Mopsy, and retrieve packaged goods from the shelf. This system works until they arrive at the Confectionery and Snacks aisle. Mopsy: Tcho snackyou! Tcho snackyou! Mopsy is frenetically pulling multipacks of Pickled Onion Monster Munch onto the floor. Mummy: Yes, they are big brother Joe’s snacks. Well done. Shall we put them in the trolley? Mopsy has now spotted Jaffa Cakes though and tears off. Admittedly these are on special offer, so it’s actually quite helpful. Mummy: Right, shall we swap? I’ll carry you for a bit Mopsy, and Flopsy can walk? Mummy has now put them both down again as her arm is about to spasm and she is also concerned that she is developing a Pisa-like lean through constantly compensating for a heavy object on her left hip. Flopsy and Mopsy have been kissed by the Charm Fairy and are actually being rather sweet, if lacking on the obedience front. Mopsy has seen a pack of Dairylea Lunchables. Mopsy is not allowed Dairylea Lunchables. Mummy: No, Mopsy, put that back, we’ve got normal cheese. Mopsy throws the Lunchables into the trolley. Flopsy has seen a large pork pie. Mummy: Yes, we can have the pie. Can you pick it up? Flopsy picks up the pie and sinks her teeth into it, through the cellophane. Mummy is mentally totting up how many aisles left, at an average of three minutes per aisle, and when she can get back to her Nicorette in the car. At that moment, a kindly Granny appears. Kindly Granny: Aw, bless them, are they twins? Flopsy and Mopsy are now standing perfectly still and smiling shyly. They are holding hands. It is eerie. Like The Shining. Doom is imminent. Mummy (tempted to say, oh, are there two? Never noticed the other one before): Yes. Flopsy and Mopsy. They’re two and a bit. Kindly Granny: Carl! Carl! Come and say hello to the little girls. Her four year old Grandson zooms down the aisle and skids to a stop. Mummy: It’s ‘hiya’ or ‘hello’, not ‘hi-llo’. But Mopsy is otherwise occupied. She is lifting her T shirt up over her face and flashing Carl. Flopsy watches her sister and does the same. Kindly Granny: Well, that’s nice. Look, they’re showing you their tummies, Carl. Mopsy then blows a raspberry at Carl and heads off towards the Ribena, with Flopsy in hot pursuit. Mummy: Ha, well, sorry about that! Mopsy, you shouldn’t blow raspberries at people. Mopsy: Mice beer? More beers? Mummy: It’s Ribena, darling. We drink Ribena. We don’t drink beer. Mummy shrugs apologetically at Kindly Granny and smiles a smile designed to communicate ‘I am a good Mum, honestly, please don’t think ill of me. I know we live near Liverpool but I am NOT encouraging my daughters to show their chests at the first sign of male interest. Nor do I let them have beer.’ Kindly Granny has her arm round Carl’s shoulders and is shepherding him away from the Lager Ladies. They have now reached the frozen aisle. Mummy gets some peas and holds them against Flopsy’s cheek. Flopsy giggles. Mummy: Clever darling, yes, they’re not hot, they’re cold. That’s the opposite. Do you want to touch them Mopsy? Mopsy blows on the peas and then touches them. Mummy shovels cartons of Ben and Jerry’s Phish Food into the trolley. Phish Food is her happy food. Mummy needs happy food. Flopsy, Mopsy and Mummy are now finally finished and need to head towards the checkout. Mummy: Right, ladies. We need to pay for all our lovely things now. Shall we go back in the trolley seats so Mummy can pack everything? Mummy: Please. I need to put all the food on the belt. Mummy: OK, well you need to be very careful not to drop anything. She passes Mopsy some sausages to put on the belt, thus generating an immediate tug of war which Flopsy wins, knocking Mopsy into the alarmed barrier in the process. Mummy: No, if I give you the apple juice it might spill everywhere. Mopsy cries. Flopsy triumphantly places the sausages on the next door belt, amongst the shopping of a bemused elderly gentleman. Mummy takes both their hands and leads them to the chairs after the checkouts, never believing for a moment they will sit there without wriggling/hitting each other/escaping from the shop/dying. Mummy: Right. Stay there quietly while Mummy does the bags and pays, and then we’ll go out and look for the cat. OK? Mummy returns to the belt and attempts to pack facing backwards to check on the girls. This is not easy. Checkout Lady: Oh look at them sitting there. They’re not moving an inch. Aren’t they adorable? They’re so well behaved. You’re very lucky, you know. It must be a breeze. Mummy gives a small constipated smile, finishes and collects the girls, who allow themselves to be lifted into the trolley without dissent. The checkout lady smiles at their compliance. Outside they locate Brutus, the Morrisons Cat, who is sunbathing on the bonnet of a sports car. Flopsy: Look! Biaow there! Hiya Biaow! Hiya Biaow! Mopsy (singing and blowing kisses): Hiya, hiya, hiya, mwah, mwah! Happle joos? Biaow wan happle joos? Flopsy: Biaow wan bump down? Mummy? Biaow bump down? Obviously the girls want to get out of the trolley to stroke the cat/yank him down off the bonnet to aid strangulation. Mopsy tries to climb onto the car; Flopsy has realised Brutus doesn’t have flashing lights or play tunes and starts running to the Noddy ride, across the main carpark exit. Mummy makes the decision to save Flopsy, while silently pleading with God not to let Mopsy set off the sports car’s alarm/fall off the bonnet and sustain a traumatic brain injury (though Mummy would be terribly good at the neuropsychological assessment thereof). Mummy: Well, that was fun, wasn’t it? Shall we head home for lunch now? Mummy: Shall we all sing ‘If you’re happy and you know it’?